I decided to have a little fun and make my own chicken dish which would resemble the popular Swedish dish “Flying Jacob” but make it Paleo approved. So instead of whipped cream I decided to use coconut milk. 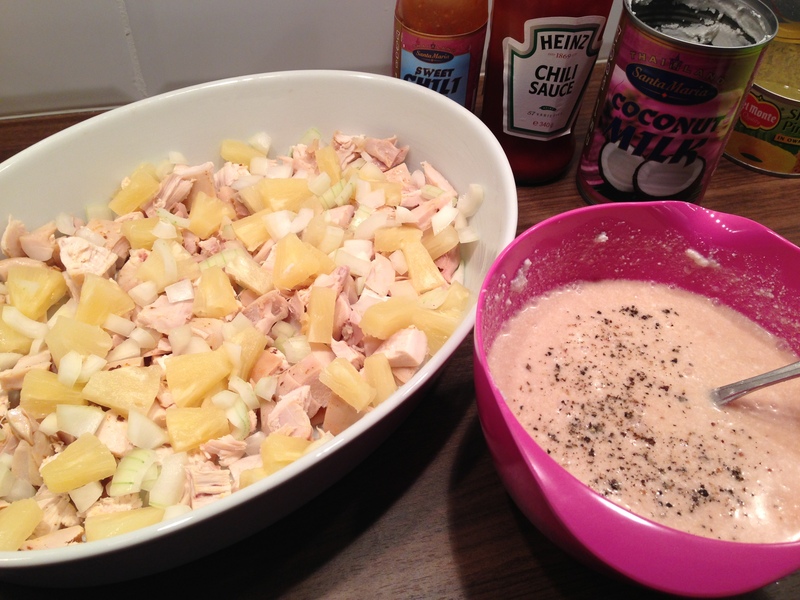 I substituted the banana for pineapple and also added onion. I skipped the bacon and the peanuts. 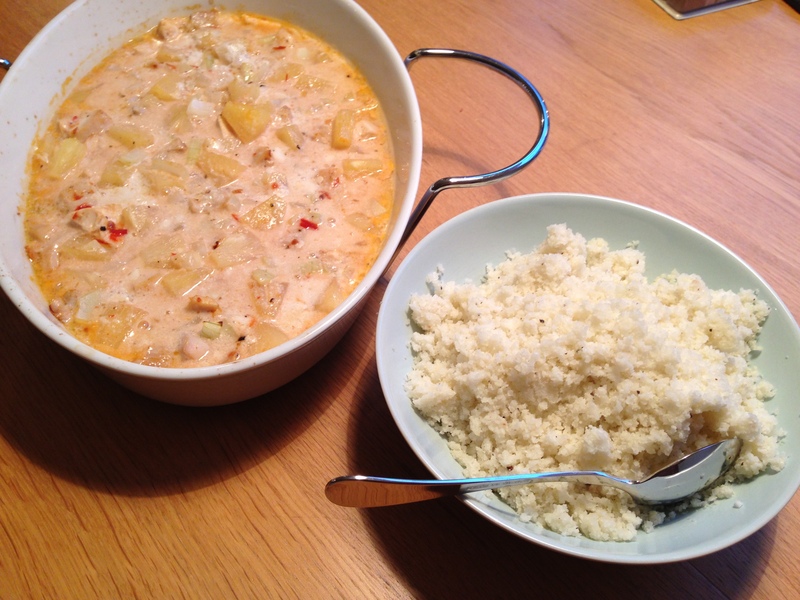 The coconut milk I seasoned with chili sauce, sweet chili sauce plus salt and pepper. Flying Jacob you serve with rice and since that is definitely not Paleo approved I remembered I read about something called cauliflower rice two weeks ago when I researched new recipes. I’m not a big fan of cauliflower but I figured I got to try it out anyway. The cauliflower was pulled into smaller pieces in order for it to fit into our food processor. We used the pulse setting until it got a feeling of regular rice. I have to say, cauliflower do NOT smell good! 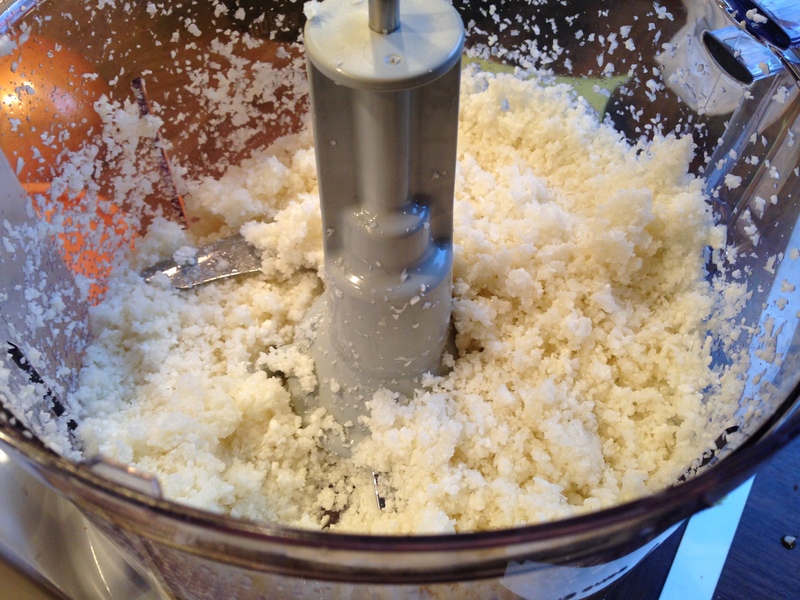 Cauliflower after being pulsed in the food processor. Next, I sautéed the cauliflower in the frying pan and after around 5 minutes it was ready to be served. (I used this recipe as a base but skipped the garlic and onion). 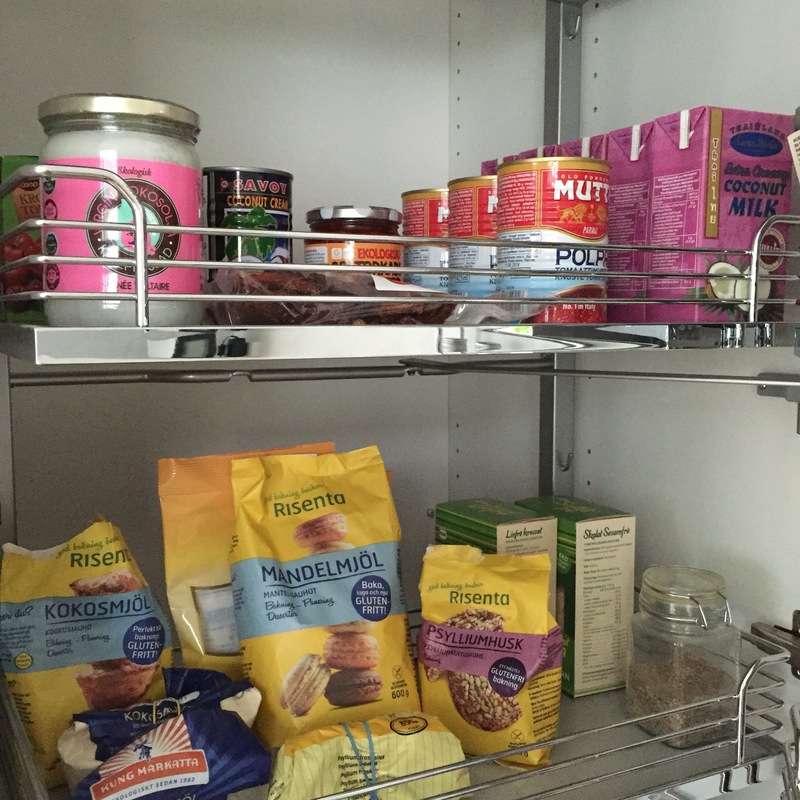 When I browsed for recipes for this weeks menu I came across something called kelp noodles. Never heard of it before so I had to research online! Kelp noodles are made from seaweed. 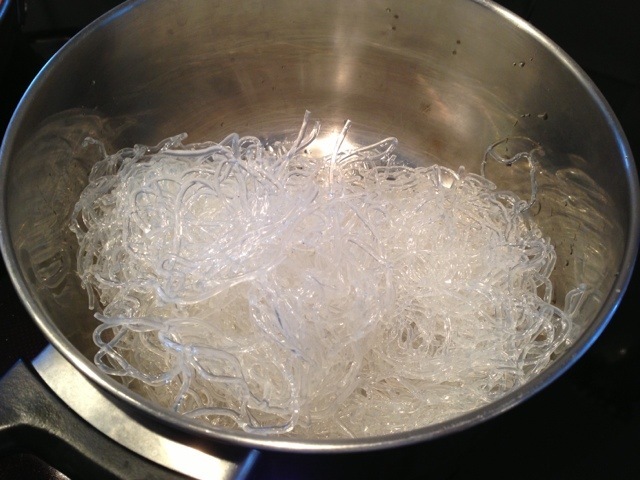 It is possible to use kelp noodles right from the bag, no need to cook them. Just rinse and put them in a salad or mix with a sauce. 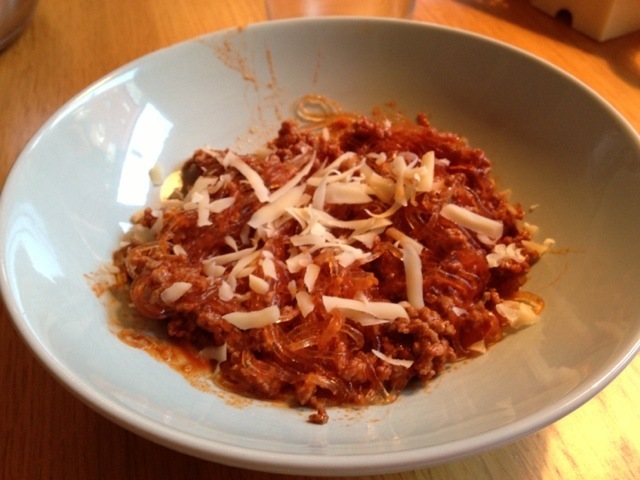 Sounded interesting so decided to try the recipe, a Paleo version of “Spaghetti Marinara”. I didn’t really expect to find it in a regular grocery store but I did. It was in the Asian aisle together with the other types of noodles that exist. I can’t say it looked like it was going to taste fantastic and when I opened the box and took out the kelp noodles it felt like “plastic” and just plain weird. Kelp noodles don’t really taste anything rather it picks up the flavor from whatever it is mixed with. In our case a chili and garlic pasta sauce. We weren’t 100% paleo as we added a little shredded cheese on top. The past two weeks we’ve tried plenty of new recipes. We’ve found some we love and some (well, at least one) we’ll never do again. A few days ago we tried grilling parsnip. Wow! That won’t be the last time for sure. As a Paleo diet means eating unprocessed food I have for the first time made my own pesto instead of buying. I found a recipe called paleo pesto on the website Paleoplan.com. Unfortunately I couldn’t make it 100% paleo as it was totally impossible to find the ingredient coconut aminos. First I tried researching online because I just didn’t know what it was. I read that the best bet was to try to find it in health stores. Well, after visiting six places I just decided to ignore it. Apparently it’s possible to order online from the UK so I’ll do that but until I have it at home I’ll just used the regular soy sauce. Or maybe try to make my own paleo approved soy sauce instead? 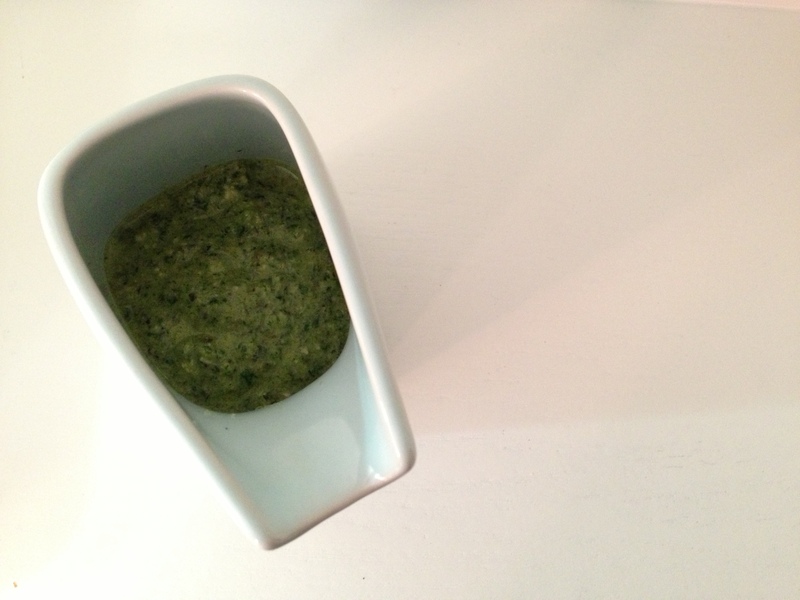 Well, the paleo pesto was very easy to make, just put all ingredients into the mixer and voila you got a very tasty pesto! 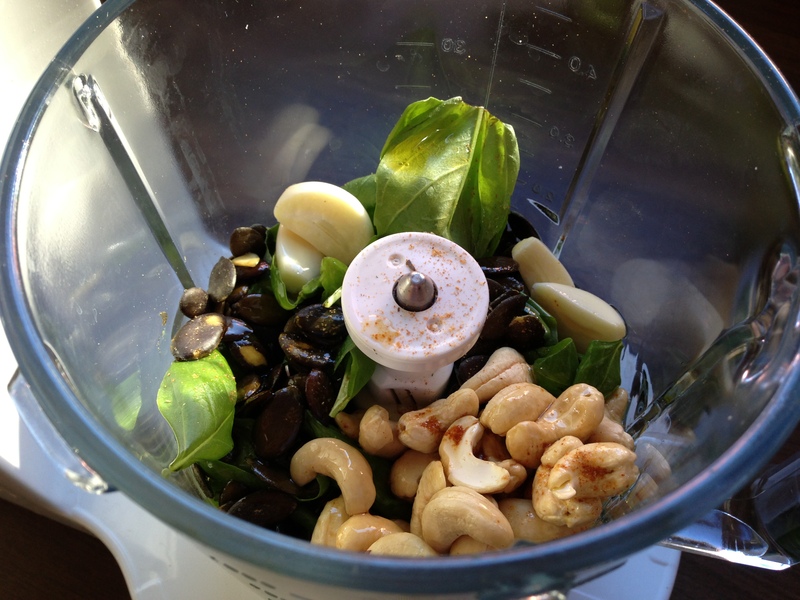 All ingredients (basil, pumpkin seeds, cashews, soy sauce and olive oil) ready to be mixed. Another meal asked for an almond thai sauce. This recipe was also found on Paleoplan.com but here I made a regular chicken salad instead of chicken wrap. One of the best homemade thai sauces I’ve ever made! 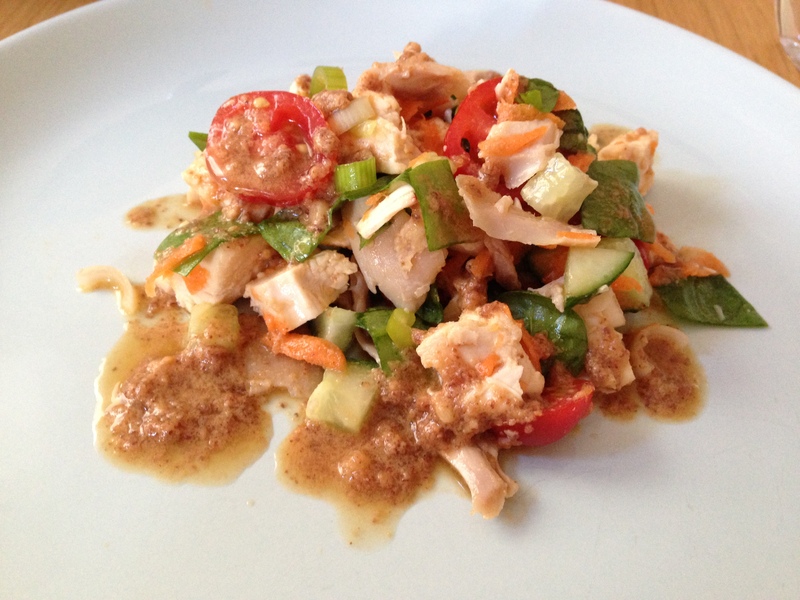 Chicken salad with almond thai sauce. 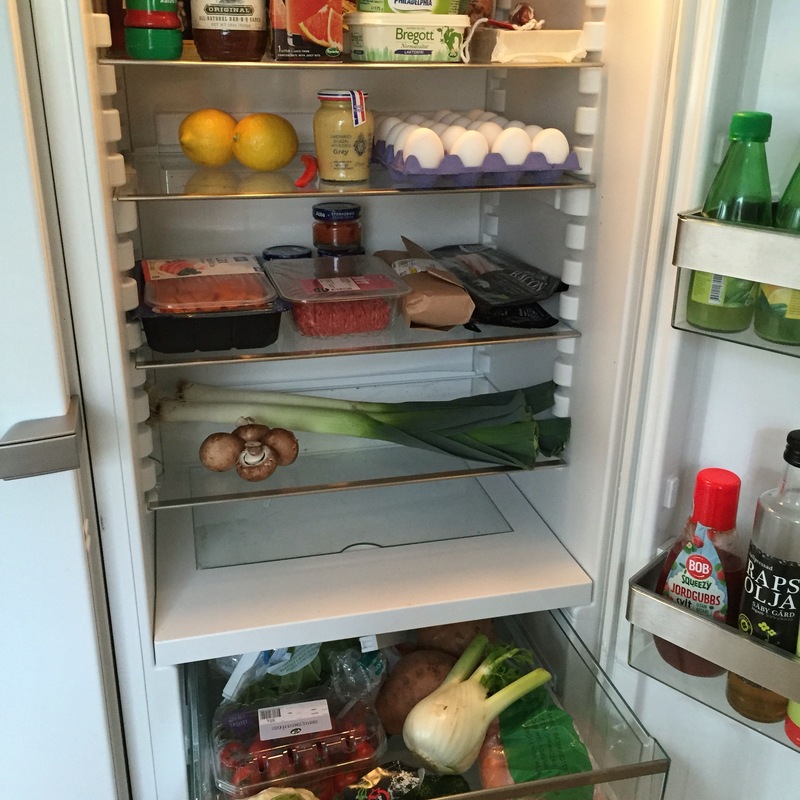 What interesting dinners will we eat next week? 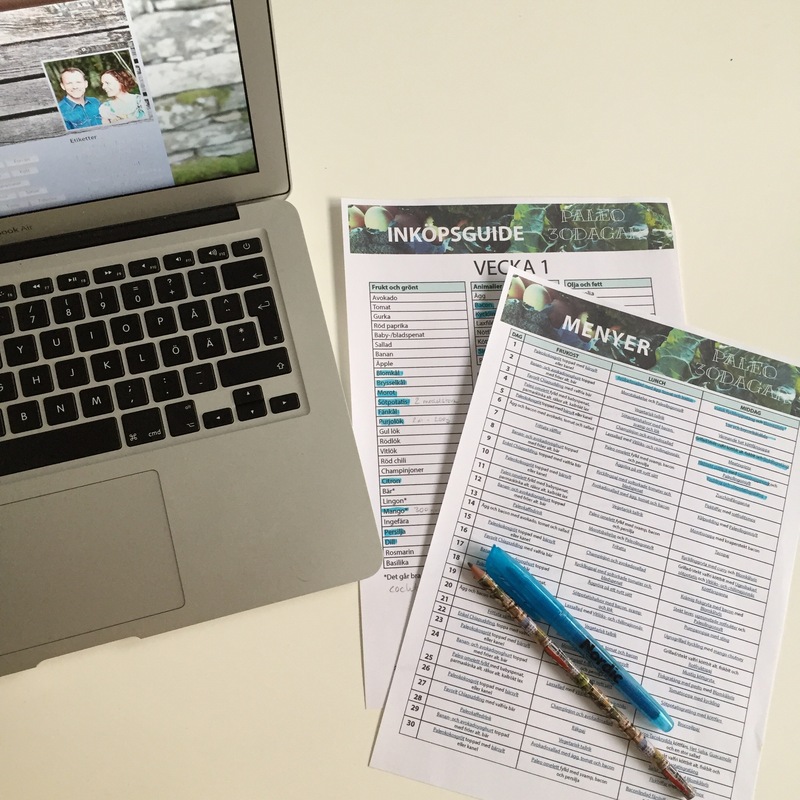 It’s so much fun to prepare the week’s menu. I enjoyed it even before we changed our eating habits but now with all the new recipes it’s even more fun. I’ve decided it’s time to get my health on track. At least the part of my health that I can do something about and control on my own. I’m sick of having to eat my daily cortisone pills and as soon as I try to lower the dosage my joints react immediately. I need to get stronger, in particularly in my knees and feet. I want to be able to vacuum under the bed. I want to be able to wear my favorite shoes (at least to parties) again. I want to be able to go geocaching in places without having to think about how my knees or feet will react. So, what to do? I figure that in order to get rid of the cortisone I need my body to be stronger and healthier. To be able to achieve this means two things… 1) I need to start exercise regularly and 2) eat better so I can loose weight. Weight loss will definitely help my knees and feet as the pressure on the joints will not be as heavy as now. I thought I had a perfect plan as far as exercising goes. I got a yearly pass to Fitness 24 Seven, and I contacted, and met, a PT that would help me get going. Suddenly my eye problem started and before I even had my first training session I had to cancel. Now my eye need to heal first and when that is done my PT is on vacation so I won’t be able to start until mid September. Bummer… and I can’t go swimming either as I can’t wear my lenses yet (only 2,5 more weeks with my cortisone drops). Double bummer… Instead I decided to start a training plan through RunKeeper (fabulous app!) and exercise by walking regularly. My goal for the end of the year is to exercise at the gym or swim once a week and then do my walking sessions 2-3 times a week. As far as weight loss goes I’m already working hard. Previously I’ve tried by counting calories. It worked wonders for a few weeks but every time I got sick after a while (either a cold, flu or joint issues) and I lost all motivation whatsoever. This time I’m not going to count calories instead I’m trying the Paleo diet. With a paleo diet grain, processed food and dairy products are forbidden, instead it’s lean meat, fish, egg, vegetables, fruit and nuts that matters. I’m not going Paleo “all the way”. I’m going to continue to eat dairy, and on special occasion bread or pasta. I’m also considering going gluten free those times I do eat bread. I’ve read a few places that claims Paleo can help RA patients so I’m gonna give it a go. A few weeks ago I started eating lactose-free and no red meat to see how my RA would react. I’m going to continue with lactose free dairy (I’ve noticed my stomach is much calmer nowadays) but I will add some red meat back into my diet again. I will continue to eat “normal” on those occasions when I’m going to places where I can’t control the menu. So, dear friends, do not panic to invite me over for dinner parties. 😉 The rules of Paleo only applies when I’m cooking. Right at the end of today’s walk a song started playing… “Dressed for success” with Roxette. Not only did it have a great beat for my walking pace but it also turned into my new mojo: Dressed for Success… in exercise and weight loss. I’m ready for a healthier me!